The Los Angeles Chargers announced today season ticket prices for 2017 home games at StubHub Center – the NFL’s most intimate venue. Prices for season tickets begin at $70 per game and range from $70 to $375 for a wide variety of seating locations (Chargers.com). Fans will witness the Chargers do battle in StubHub Center against the Philadelphia Eagles, Washington Redskins, Buffalo Bills, Cleveland Browns, Miami Dolphins and their rivals in the AFC West: the Kansas City Chiefs, Oakland Raiders and Denver Broncos. The dates for these matchups will be announced when the NFL schedule is released in April. “Playing at StubHub Center is going to offer fans a rare opportunity to see NFL action in a uniquely intimate setting,” said Chargers President - Business Operations A.G. Spanos. “Every seat at StubHub Center will feel close to the action and fans will be right there with us on every play. Not many venues can make this claim and we expect to sell out quickly. “Our game-day experience is going to be awesome,” added Spanos. “We have one of the most exciting offenses in the NFL and a new head coach who is already injecting new energy into our entire organization. Fans can join the waitlist for season tickets by placing a fully-refundable $100 deposit at FightForLA.com. 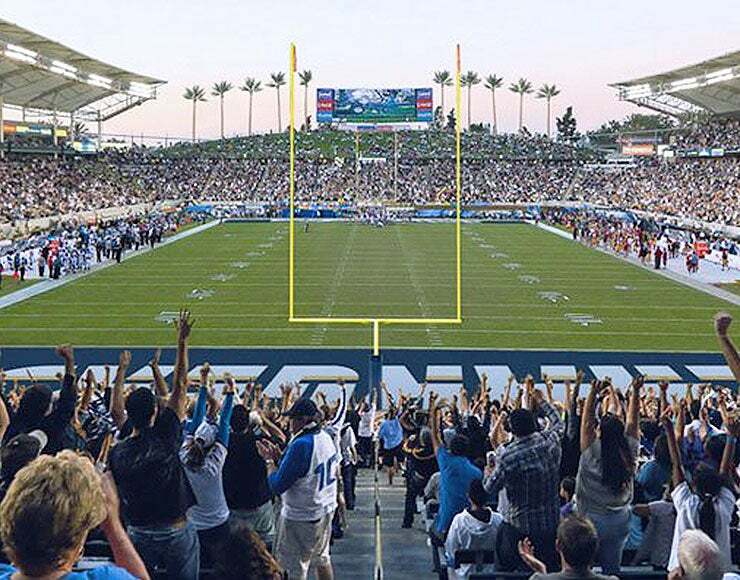 This fully-refundable deposit grants priority status to buy season tickets for games at StubHub Center as well as priority status for the new Los Angeles Stadium at Hollywood Park. Each deposit-holder can purchase up to four season tickets for Chargers home games at StubHub Center.